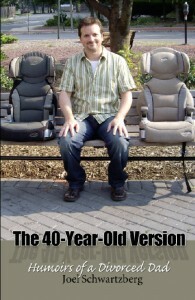 Joel Schwartzberg, a 40-something writer and divorced father of two, contacted me recently about his new book, “The 40-Year-Old Version: Humoirs of a Divorced Dad,” and was kind enough to provide an essay for a guest Jam here at The Dad Jam. I have started reading it, and I am enjoying it so far. I am not a divorced dad (and hope to stay that way), but I find it is very interesting to get Joel’s “Divorced Dad” perspective on parenting and fatherhood. When I’m finished reading it I will post a more detailed review, but for now, please enjoy one of the essays from his book to get an idea of what a brilliant writer he is. It is an essay about one of his typical “Lazy Dadurdays” with his kids. You’ll see that Joel has a great sense of humour and provides insights that all dads, whether married, divorced, common-law, or what-have-you, can relate to at some level. “What do you guys want for breakfast?” I ask my three pajama-wearing kids flopped sleepily over two couches on a promising Saturday morning. They’re with me every Saturday morning as part of a divorce agreement. We call it “Lazy Dadurday.” And lazy it is. We wake up late, then trek to the bookstore, the pet store, the mall, or the pool, and just let it all hang out. “What is there?” the kids ask absent-mindedly. My children have faced the same breakfast choices since they were old enough to chew: frozen waffles, cereal, and toast. No more and no less. It’s their version of death and taxes. Nonetheless, the sweetly inquisitive response — what is there? — is always the same. It’s as if they’d been replaced overnight with benevolent alien imposters who’d carefully studied everything about us but our breakfast rituals. Just to be sure, I ask the kids to pick a TV show. This creates a raucous argument that would inevitably result in the destruction of a remote control had I not already placed it in protective custody. “Waffles. Cereal. Toast,” I say like a diner waitress working her last hour. “Can I have some soda?” Miranda says with wide eyes, on cue. The déjà vu is nearly overwhelming. Their mental lethargy isn’t malicious. I call it “selective memoritis,” a genetic syndrome that enables children to genuinely forget simple things at will. Experts — and by that I mean Mommies — tell me that this is very age-appropriate for the under-ten set. Several soggy bowls of Cheerios later, I ask Miranda to remind me whose turn is it to pick our weekly lunch spot. I’m instantly reminded of a joke: How many siblings does it take to screw in a light bulb? Three. One to screw it in and two to complain about not getting a chance. “It’s MY turn,” Miranda says with supreme confidence, just as she did last Dadurday and the Dadurday before that. In terms of memoritis, she’s perhaps the most symptomatic of all three kids. Charlie patiently recounts for Miranda the past few Dadurdays in precise detail, pointing out that it’s now his turn to choose, but she refuses to concede. As Charlie plots his next move, Cindy quietly lines up her baby dolls, oblivious to her siblings and completely indifferent about whose turn it is. She’s easy to please, probably figuring she can get a decent grilled cheese anywhere. Miranda finally relents, then brokers a Major League Baseball-like deal in which she gives up a future turn in exchange for influence in Charlie’s decision-making today. The agreement will never stick, but no one’s thinking about that except me. “Dad, can we go now?” Charlie says. We suit up and hit Charlie’s favorite Chinese restaurant for fried tofu, chicken satay, and spring rolls. Like every Dadurday at the Chinese restaurant, we charm the waiter, play with the chopsticks, and ask for gratuitous amounts of duck sauce. Miranda collects everyone’s silverware, Cindy plays with her ice, and Charlie reads insignificant parts of the menu. We eat like peasants at the feast, and the girls delight at the crunchy fate-filled cookies that come in a little bamboo tray with the check. All in all it’s a pretty unremarkable Dadurday lunch. “This is the BEST Lazy Dadurday EVER!” Miranda says with absolute certainty and a greasy grin. The other two cheer inagreement, waving forks of sticky rice. “This is indeed the Best Dadurday ever,” I pronounce, letting Miranda sip more of my Diet Pepsi. We take a minute more to finish the meal, then messily crack open our fortunes. A good story. I’m glad your hanging in there. Thanks Paul, glad you like the article!